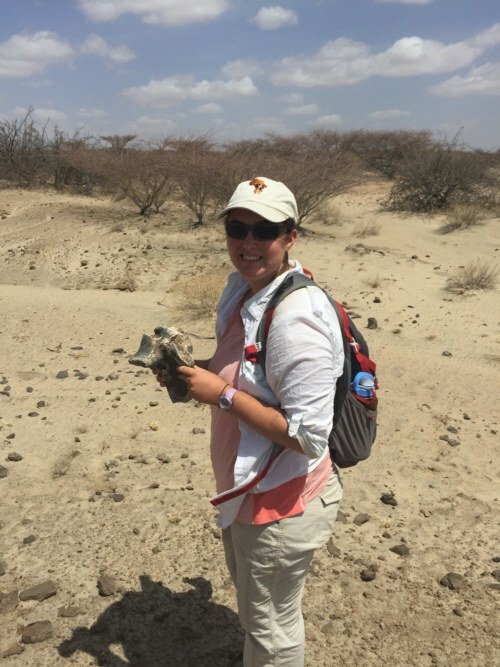 Following our first two days of class in the lab, we spent the day in the field Wednesday visiting the site of an important hominin discovery. In an attempt to beat the heat, we boarded the lorry at 7 a.m. to get an early start, arriving in Area 10 by 7:45. 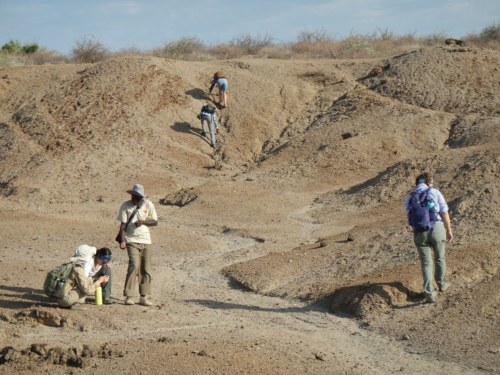 Sale and Apolo lead the way to the excavation site, and once there, described how their team found an almost complete Homo habilis cranium, sans maxilla. Though the site is now just the remnants of an excavation, it hit home nonetheless: a strange feeling washes over you when you realize that ancestral hominins, that hold the secrets to our natural history, that you can not only see but even feel their resemblance to us, used to inhabit this area. 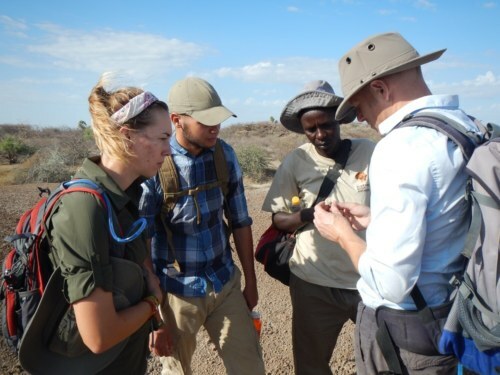 This experience really exemplifies the difference between learning about Human Origins at TBI as compared to in a classroom; the only way to truly experience that feeling of awe is to visit such a place. 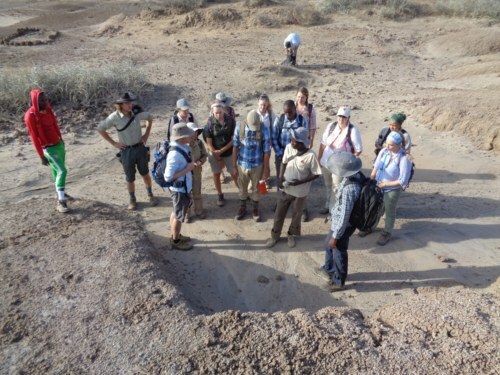 Sale describes to the group how they found the cranium and the excavation process that followed. 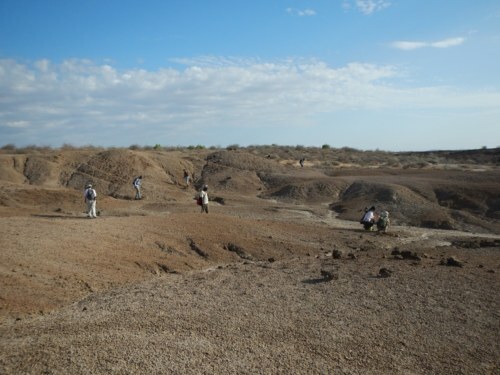 The excavation site; you can see how much sediment was removed and sieved through as they searched for other hominin fossils. Because the hominid team that excavated this find only discovered the cranium of this specimen, it is likely that the remaining skeletal anatomy of that individual, or other fossilized hominins, is still lying hidden in the area. We spent the rest of the morning prospecting for hominins! After learning about the excavation site, we spread out to better search the area! 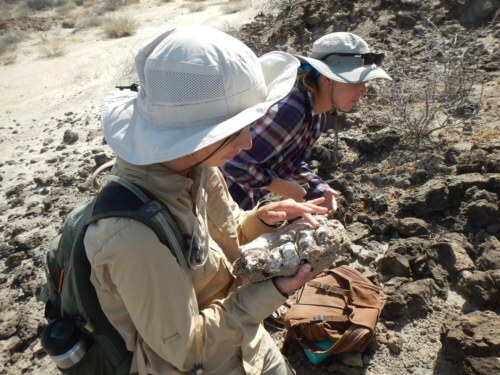 Jayde and Sale help Carla identify a fossil. 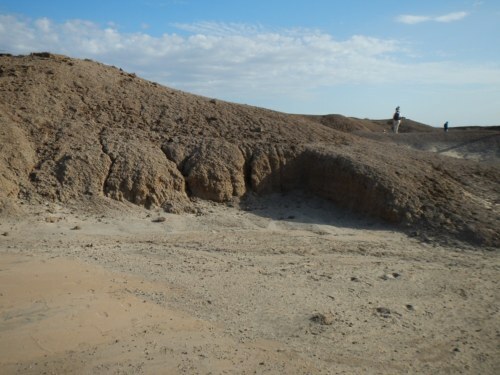 In the background, Tobias and Emily search the gullies of a hill. 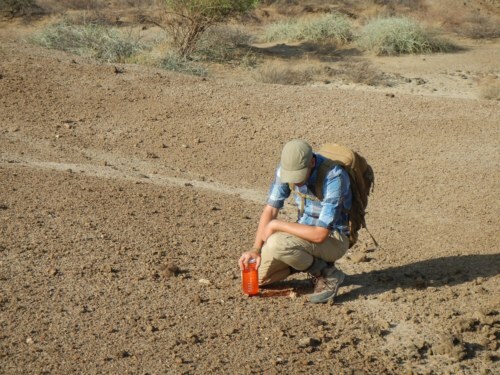 Max scans the ground for smaller fossils. 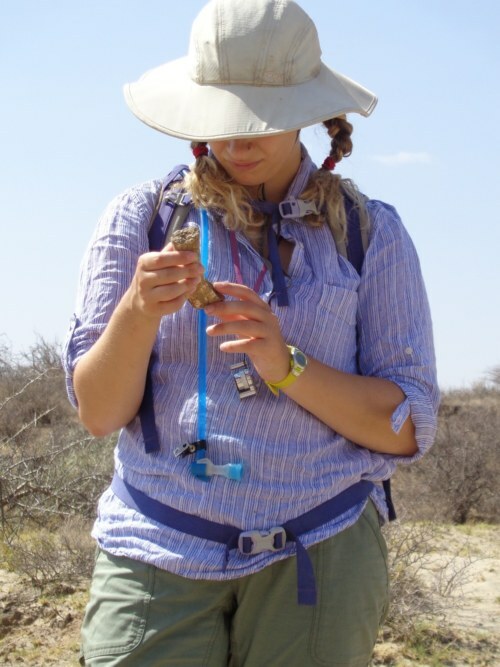 While we unfortunately did not discover any hominins, we did find several other faunal fossils, and still learned through experience a valuable lesson: it is very difficult to find hominins! There are several reasons why fossil hominins are not rampant: hominins most likely only made up a small proportion of the extant organisms at the time of their existence, and as such, most likely are represented proportionately in the fossil record; and because hominins tend to have longer lifespans and are rather intelligent mammals, they do not die as frequently as other animals and are unlikely to die from being stuck in mud, clay, or other such sediment traps. Dr. Skinner discusses the morphology of this femoral head with Natalie. 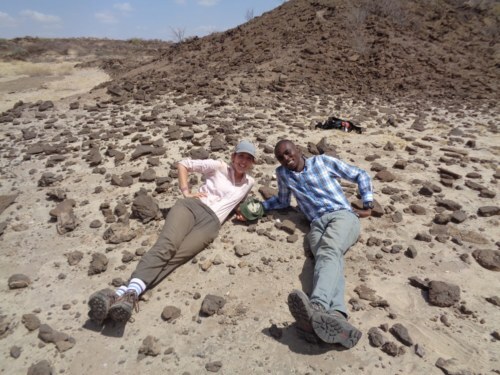 Millie and Tobias pose next to their find (inside the small rock circle between them); they crawled all over this area, collecting many fragments of teeth that they pieced back together! Kathryn examines this fossil metapodial. Carla feels the enamel still preserved on the teeth, still intact within this mandible. Dr. Skinner and Sale discuss what the fossil Max found may be. 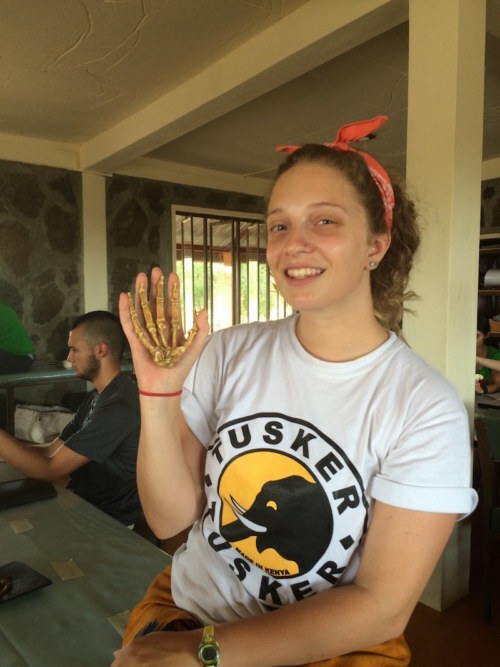 Morgan found a very well-preserved proximal tibia! 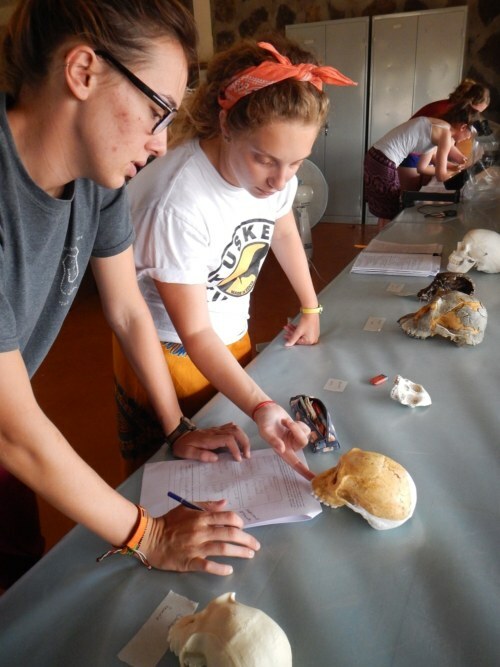 The next day in class we learned about gracile Australopithecines and the similarities and differences of their morphology, as compared to extant primates (such as chimpanzees, orangutans, and gorillas) and other hominins, including both Ardipithecus and us, Homo sapiens. 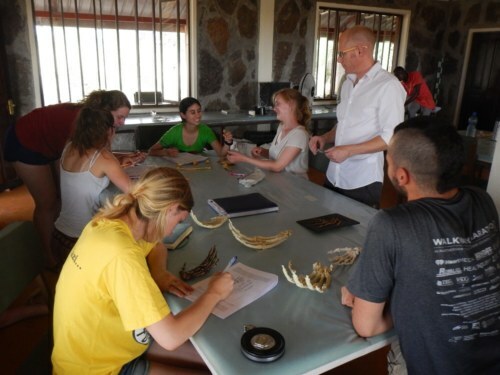 We accentuated what we learned in lecture by moving into the lab in the afternoon: by using casts of several of these specimen, we were able to see hands-on how the skeletal morphology of these organisms compared! The lab was made up of six different stations, which consisted of comparing size and morphology in the hands, feet, upper and lower limbs, pelvis, and cranium of several different specimen, as well as identifying different anatomical features of Australopithecus sediba and Australopithecus afarensis by using their fossil-casts. 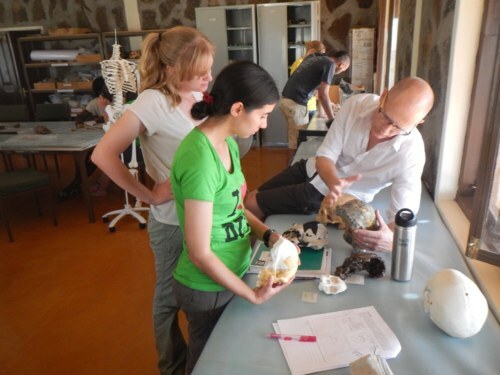 Dr. Skinner looks on as the students identify the skeletal anatomy of Au. sediba. Tobias and Jon discuss the functional morphology of the foot, concerning a chimpanzee and human. 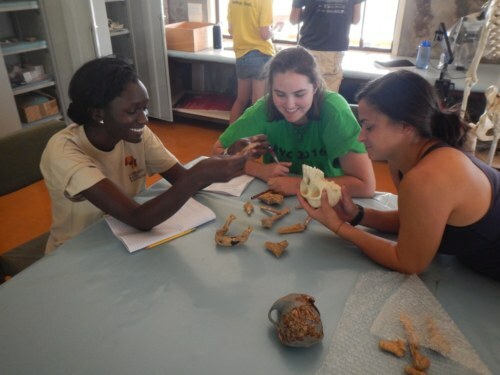 TA Jayde helps Esther and Morgan identify the occipital bone from the cast of Lucy. 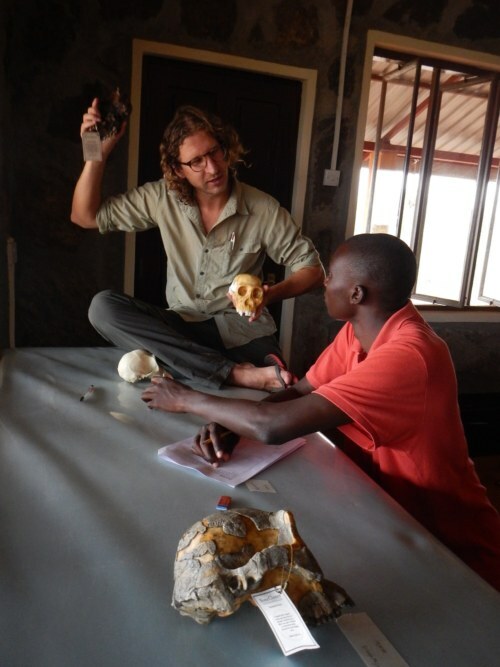 Dr. Skinner explains how to distinguish between the different gracile Australopithecines. 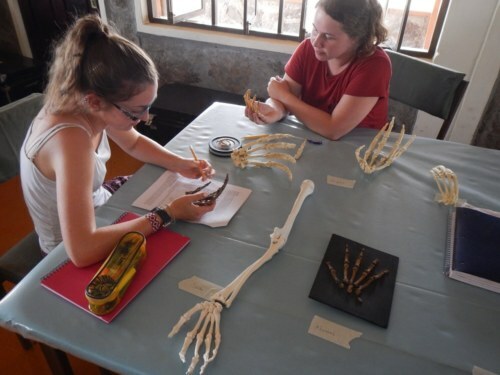 Millie and Yvette compare the size and shape of phalanges and metacarpals of extant apes, fossil hominins, and humans. Kathryn and Danielle discuss the teeth of Au. sediba. Jon and Tobias discuss how the cranium of Au. sediba compares to other gracile Australopithecines. 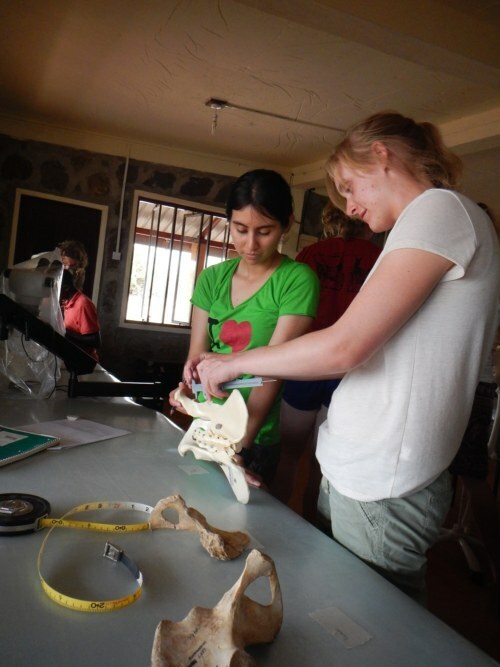 Carla and Natalie measure the height and width of the chimpanzee pelvis, which they will compare to the pelvis of Lucy and a modern human. 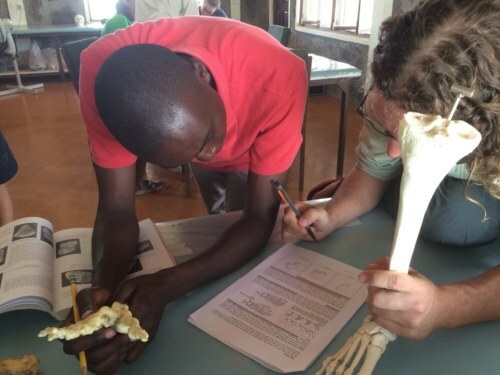 Max and Emily have a blast learning about lower limb morphology with Dr. Skinner! 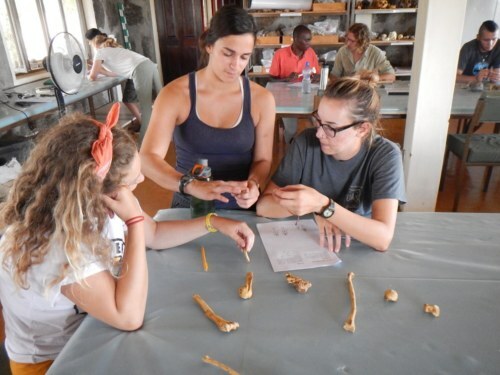 TA Jayde helps Danielle and Kathryn determine which side of the body this bone is from. Kathryn’s hand is only a little larger than Au. sediba‘s! Stay tuned as we continue to explore hominin origins next week, slowly and steadily coming closer to modern humans!